Knowing Exactly Where your Customers are on their Buyer's Journey will allow you to Create More Targeted Content. You’re catching up over coffee with your friend Alice who happens to be the owner of a growing e-commerce site that sells office supplies. As you notice Alice distractedly googling while you check the menu, she tells you “I never imagined sales being so stressful”. You then learn that she hired a couple of sales guys and even though it’s only been a few months, she has a gut feeling that they won’t hit their targets. A quick glance at her smartphone tells you she’s reading up on sales automation software. “Why don’t you just outsource sales to people who really know what they’re doing.”, Mark, a friend who works in marketing at an IT firm and who’s stopped by, chimes in. “I could send you a vendor comparison chart we put together recently at work if that would help.” he adds. You wait to weigh in. As someone with expertise in this area you know all about the buyer’s journey - the three stages that occur before a consumer makes a purchase; awareness (realizing they have a need or problem), consideration (researching and considering the different approaches and solutions that exist) and decision (deciding which solution or provider to go with and justifying that decision). It’s clear to you that Alice is nowhere close to being able to make a decision. She’s only now becoming aware of her pain point - the fact that she needs help with sales. Alice is in fact at the very beginning of her buyer’s journey and about to go down the rabbit hole like her literary namesake. As she is only at the awareness stage, you know that what she needs is not a sales pitch or a vendor comparison as Mark had suggested. What Alice is really looking for is the key information and data that will help her find the best sales solution. 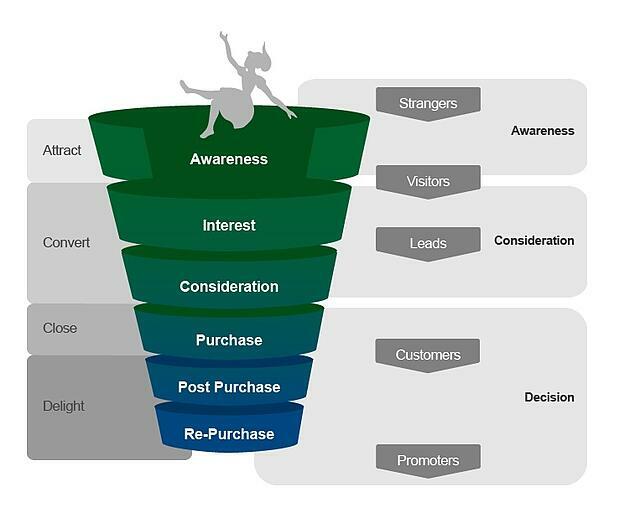 The buyer’s journey is key to your inbound marketing strategy. If the information buyers research before they purchase something is the main factor influencing them, then of course any successful sales or marketing team will need to pay close attention to every step of this journey. This is where the strategic importance of content marketing comes into play to target every buyer according to which stage they are at on the buyer’s journey. Increased Customer Trust - Content that answers your prospect’s questions and provides added value helps you nurture them into leads and eventually customers by doing one essential thing - building trust. Guiding and being informative builds your credibility in the long run rather than pushing and being salesy, and means that when the time comes to make a decision, the natural choice is a decision to buy from you. Greater Influence - The trust that customers place in you, combined with the power of social media and word of mouth, will make you a thought leader, benchmark and the go-to place for credible information in your industry which all translates into one thing - influence! The ability to influence someone according to where they are on their buyer’s journey gives you better sales conversion rates in the most cost-effective way. In fact for many businesses where low margins and competitive pricing are a given, leveraging this influence and incentivizing customers to do their homework with you is truly win-win as it means you have captured them at the most crucial stage of their buyer’s journey.